One saturday morning I was having a breakfast and I discovered face_recognition project. I started to play with the opencv example. I put my picture and, Wow! It works like a charm. It’s pretty straightforward to detect my face and also I can obtain the face landmarks. One of the landmark that I can get is the nose tip. Playing with this script I realized that with the nose tip I can determine the position of the face. I can see if my face is align to the center or if I move it to one side. As well as I have a new iot device (one ESP32) I wanted to do something with it. For example control a servo (SG90) and moving it from left to right depending on my face position. First we have the main python script. With this script I detect my face, the nose tip and the position of my face. With this position I will emit an event to a mqtt broker (a mosquitto server running on my laptop). Now another Python script will be listening to mqtt events and it will trigger one event with the position of the servo. I know that this second Python script maybe is unnecessary. We can move its logic to esp32 and main opencv script, but I was playing with mqtt and I wanted to decouple it a little bit. 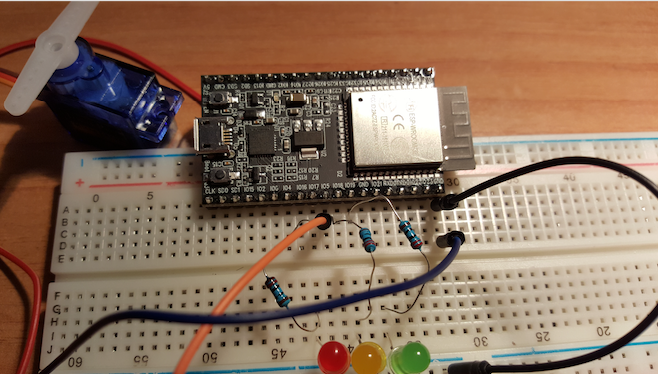 And finally the ESP32. Here will connect to my wifi and to my mqtt broker. The source code is available in my github account. Web Architect. PHP, Python, Node, Angular, ionic, PostgreSQL, Linux, ... Always learning. Posted on April 9, 2018, in IoT, Python, Technology and tagged Arduino, esp32, IoT, mqtt, opencv, Python. Bookmark the permalink. Leave a comment.